The Mangrove Nine Trial was Britain’s most influential Black Powertrial. In Britain, descendants from the Caribbean, Africa, or South Asia, who were mainly immigrants from former British colonies, were considered to be “black.” The London police and the British Home Office responsible for immigration, security and law and order orchestrated the arrest and trial of nine black leaders in 1970 to discredit London’s growing Black Power movement. The Mangrove trial focused on the police harassment of the Mangrove restaurant in west London’s Notting Hill area, which was owned by Frank Crichlow, a Trinidad-born community activist. The restaurant was the heart of the Caribbean community and was also popular with white and black celebrities. Because Crichlow was a Black Power activist, police raided his restaurant 12 times between January 1969 and July 1970, calling the Mangrove a den of drugs without finding any drugs. In response to this intense police harassment, Crichlow filed a complaint to the Race Relations Board accusing the police of racial discrimination. Furthermore his employee Darcus Howe, a Trinidad-born Black Power activist, encouraged Crichlow to work with the British Black Panthers (BBP) in London to organize a demonstration against police harassment of the Mangrove. On August 9, 1970, 150 protesters marched to local police stations and were met by 200 police who initiated the violence that ensued. Nine protest leaders were arrested and charged with incitement to riot: Crichlow; Howe, who later became a BBP member; Althea Jones-Lecointe, head of the BBP; Barbara Beese, BBP member; Rupert Boyce; Rhodan Gordon; Anthony Innis; Rothwell Kentish; and Godfrey Millett. Initially the court dismissed the charges because the statements of 12 officers were ruled to be inadmissible because they equated black radicalism with criminal intent. However, the Director of Public Prosecutions reinstated the charges and the defendants were rearrested. The nine defendants used a radical legal strategy in the subsequent trial. Howe and Jones-Lecointe defended themselves arguing that this was a political trial. The radical lawyer Ian McDonald represented Beese and coordinated the defense of Howe and Jones-Lecointe with the other defendants’ lawyers. Howe and McDonald argued for the right to an all-black jury under the Magna Carta’s ‘jury of my peers’ clause. McDonald cited case law allowing Welsh miners to have an all-Welsh jury that led to the practice of selecting juries from the defendant’s neighborhood. The conservative judge rejected these arguments. During jury selection the defense dismissed 63 potential jurors, ensuring that there were only two blacks on the 12-person jury. During the 55-day trial Jones-Lecointe described police persecution of Notting Hill’s black community. Howe exposed inconsistencies in police testimony, and a police officer had to leave the courtroom when he was seen signaling to prosecution witnesses as they testified. Meanwhile outside the courtroom, the BBP organized pickets and distributed flyers to win popular support. Ultimately the jury acquitted all nine on the charge of rioting. When Judge Edward Clarke stated that there was evidence of racial hatred on both sides, this was the first time a British court judge acknowledged racial discrimination and wrongdoing by the London police. 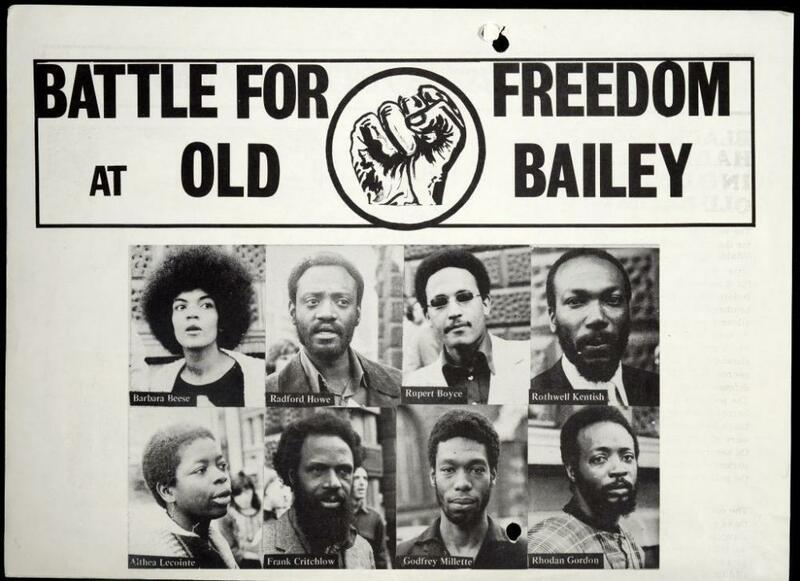 The Mangrove Nine gathered broad public support for the fight against police racism in Britain and showed that the fight for racial justice could be won. Robin Bunce & Paul Field, “Mangrove Nine: the court challenge against police racism in Notting Hill,” The Guardian (Nov 29, 2010) https://www.theguardian.com/law/2010/nov/29/mangrove-nine-40th-anniversary; Joshua Guild, “You can't go home again: Migration, citizenship, and black community in postwar New York and London,” Ph.D. Dissertation, Department of History, Yale University, 2007); Vicky Iglikowski & Rowena Hillel, “Rights, resistance and racism: the story of the Mangrove Nine,” The National Archives (October 21, 2015), https://blog.nationalarchives.gov.uk/blog/rights-resistance-racism-story-mangrove-nine/; “When cops raided a hip 1970s London cafe, Britain’s Black Power movement rose up,” Timeline, https://timeline.com/cops-raided-a-1970s-london-cafe-britains-black-power-movement-ff855e7b23f0. Robin Bunce & Paul Field, “Mangrove Nine: the court challenge against police racism in Notting Hill,” The Guardian (Nov 29, 2010) https://www.theguardian.com/law/2010/nov/29/mangrove-nine-40th-anniversary; Joshua Guild, “You can’t go home again: Migration, citizenship, and black community in postwar New York and London,” Ph.D. Dissertation, Department of History, Yale University, 2007); Vicky Iglikowski & Rowena Hillel, “Rights, resistance and racism: the story of the Mangrove Nine,” The National Archives (October 21, 2015), https://blog.nationalarchives.gov.uk/blog/rights-resistance-racism-story-mangrove-nine/; “When cops raided a hip 1970s London cafe, Britain’s Black Power movement rose up,” Timeline, https://timeline.com/cops-raided-a-1970s-london-cafe-britains-black-power-movement-ff855e7b23f0.